Video clip synopsis – More than 300,000 migrants had their first taste of Australian life at the Bonegilla Migrant Camp in Victoria before moving out to transform Australia socially and culturally. Broadband MP4 bonegilla_bb.mp4 (18.8MB), suitable for iPods and computer downloads. 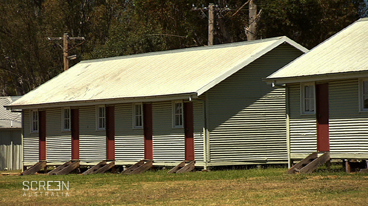 Bonegilla Migrant Camp is an episode from the series Australia’s Heritage – National Treasures with Chris Taylor, produced in 2009. Bonegilla, near Albury in Victoria, was the largest and longest operating migrant reception and training centre of the post-war era. Altogether over 300,000 people, mainly from Europe, came through Bonegilla between 1947 and 1971. Bonegilla is very important as a place which demonstrates a defining change in Australia’s immigration policy. Previously, immigration was subject to the White Australia Policy, and most migrants had come from Great Britain. After the Second World War, though, driven by the requirements of defence and labour essential to Australia’s expansion, the government embarked on ambitious expansion combined with an extensive immigration programme. Australia showed great potential for growth and could offer people from war-torn Europe an optimistic future. Perceptions of threats to Australia in World War Two and the need for a much larger population to defend itself led to the popular expression ‘Populate or Perish’. More than half of these new European migrants were sent to Bonegilla where they were given courses in English and the Australian way of life. Displaced Persons and other non-British migrants were subject to tighter labour arrangements and different controlling activities. Voluntary and refugee migrants were offered a two year directed-labour contract in return for their passage to Australia. Under this contract there were two classes of worker — men were ‘labourers’ and women were ‘domestics’, who were to be assigned to work in ‘critical areas of the economy’. The settlement in Australia of post-war immigrants has had a major impact on the nation’s economy, society and culture and is regarded as an important factor in shaping the nation. Post-war immigration transformed the composition and size of the Australian population and is responsible for the second largest demographic change in the nation’s history (the largest being the gold rush migration of 1851-1860). Where, when and why was the Bonegilla migrant camp set up? Describe the differences between the official government view of migrants’ experiences of Bonegilla and the views of the migrants themselves. Explain the events leading to changes in the way Bonegilla was organised for the residents’ benefit. In what ways were living conditions improved? In pairs carry out research about the immigration program begun in 1947 under Australia’s first Minister for Immigration, Arthur Calwell. Plan and create a two-page spread for a popular-style history magazine about the immigration program, particularly concentrating on the years Bonegilla camp operated. Include illustrations as required, and also a graphical representation, in population figures, of the range of non-British nationalities who migrated to Australia in those years. Plan and write a commentary in 500–600 words on the longterm effects on Australian society and culture since post-World War Two, of the huge non-British immigration program carried out by successive Australian governments over many decades.